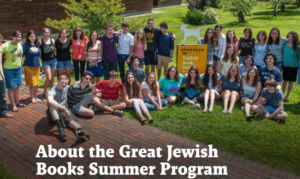 At the Yiddish Book Center’s Great Jewish Books Summer Program, rising high school juniors and seniors read selections from important works of modern Jewish literature and consider how they speak to the opportunities and challenges we face today. Under the guidance of college professors, they consider how the rich legacy of modern Jewish literature can inform us in the twenty-first century. 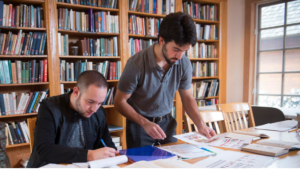 Participants spend their days at the Yiddish Book Center, immersed in a lively world of Jewish culture, and live in dorms on the nearby campus of Hampshire College. get a taste of college life, from dormitory living to seminar-style classes. Students at Great Jewish Books come from a wide variety of backgrounds, Jewish affiliations, and experiences. We welcome people with multiple heritages, people of color, LGBTQ+ participants, and non-Jewish participants. Anyone who has an interest in Jewish literature and culture is welcome to apply. A printable flyer is available for download below. Questions? See our Frequently Asked Questions, or contact Margaret, education program assistant, at [email protected] or 413-256-4900, ext. 152. New! Follow us on Instagram at @greatjewishbooks to see photos from previous years, news from the Center, and updates on the 2019 program. Support for the Great Jewish Books Summer Program has been provided by Walter, Arnee, Sarah, and Aaron Winshall. ← Sold-Out “Fiddler” in Yiddish Returns February 11!